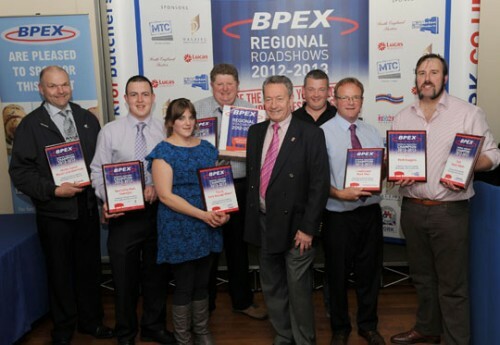 Pasties are a favourite in the South West, so it was fitting that a ‘Pork and Apple Pasty’ was crowned Overall Champion at the latest stop on the BPEX Pork Product Excellence Awards tour 2012-2013. The pasty from Tim Potter Son & Daughter Ltd, Wellington triumphed from more than 130 product entries at the event, held at the Sandy Park Conference Centre in Exeter. 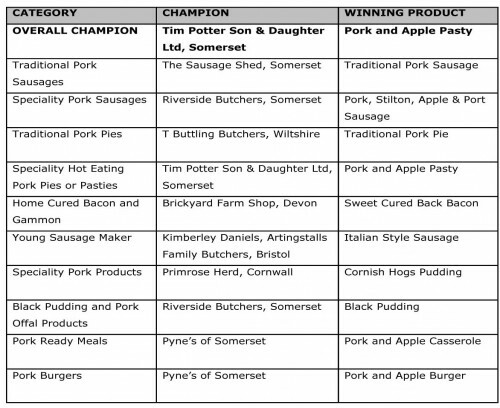 Also celebrating were double category champions Pyne’s of Somerset and Riverside Butchers, Taunton, while young butcher Kimberley Daniels took the Young Sausage Maker title for the second year running. A delighted Tim Potter said: “I really can’t believe it, this is by far the best result we’ve ever had! We are renowned for our pasties, making and selling some 300 to 400 every week, so it was only right that we put them forward for evaluation. We’ve a number of different varieties; including ‘Steak’, ‘Steak and Stilton’ and a new ‘Pork Tikka Pasty’, which also picked up a bronze award. However, the Pork and Apple really hit the spot. “We started making it a few years ago and have gained silver and gold awards along the way with helpful feedback from the judges. We took it all on board and made a number of improvements for this year’s event; increasing the meat content, soaking the apple pieces in apple juice to really enhance the flavour and using the best glaze to give it a nice pie polish. The result was brilliant and I couldn’t be happier that it was chosen as the Champion product for the South West. The category champions are pictured with Keith, from left to right: Adrian Edwards of Brickyard Farm Shop, Steven Winn of Riverside Butchers, Young Sausage Maker Kimberley Daniels, Overall Champion Tim Potter, Ivan Thompson of The Sausage Shed, Paul Buttling of T Buttling Butchers and Malcolm Pyne. Pork and apple was also a winning combination for Pyne’s of Somerset. Their ‘Pork and Apple Casserole’ and ‘Pork and Apple Burger’ topped the Pork Ready Meal and Pork Burger categories. Malcolm said: “We’re really pleased, particularly as we’ve not been able to enter the event in recent years due to the expansion of the business. So to come back and claim two champion titles in the first year for the new business is brilliant. We’ve re-located and invested in the prepared meals section so to get such a prestigious accolade for one of our ready meals is great. “The idea for the dish came about only a month ago when we had some lovely apples in. The kitchen played around with them and the casserole was produced as a result – just tasting it for the first time I knew we were onto a winner, it’s 100% homemade and ideal for the time of year. Steven Winn, who runs Riverside Butchers in Taunton with his father, was delighted with their 100% success rate – five gold awards for five products entered, plus champion titles in the Black Pudding and Speciality Pork Sausage categories. In the Young Sausage Maker category Kimberley Daniels from Artingsalls Family Butchers in Bristol wowed the judges with an ‘Italian Style Sausage’. The North West roadshow is next, taking place at the Reebok Stadium, Bolton on Wednesday 31st October. Entry forms and guidelines can be downloaded from http://porkforbutchers.bpex.org.uk. Butchers are welcome, even if they’re not entering products; it’s free to attend and they get the chance to meet industry experts and suppliers, and pick up new product ideas.